December 11, 2010 By Reuben Bolieu & filed under Against All Odds, All Articles, More…. Bushcrafting is long-term wilderness living, depending on skills and knowledge. These skills teach a deep respect for nature and make life in the wild not only bearable, but also comfortable. Although other tools are required for bush living, this article will focus primarily on the knife. In the United States, we use the term survival knives to loosely describe knives used in the outdoors when lost in a wilderness environment. In the United Kingdom, Australia, Canada, New Zealand and parts of Africa, they call them bushcraft knives. These knives are usually of the “one knife does all” variety, knives that are able to complete most tasks in a pinch. JK Handmade Knives Bushcrafter blade is made from 01 steel and is 1/8 inch thick. Cutting edge is 3 7/8 inches long with an overall length of 8 ¼ inches. Good bushcraft knife has thumb notch cut into handle scales near the blade. What exactly makes a good bushcraft knife? Function has to be considered when selecting a knife solely for bushcraft. The simpler the better definitely applies here. 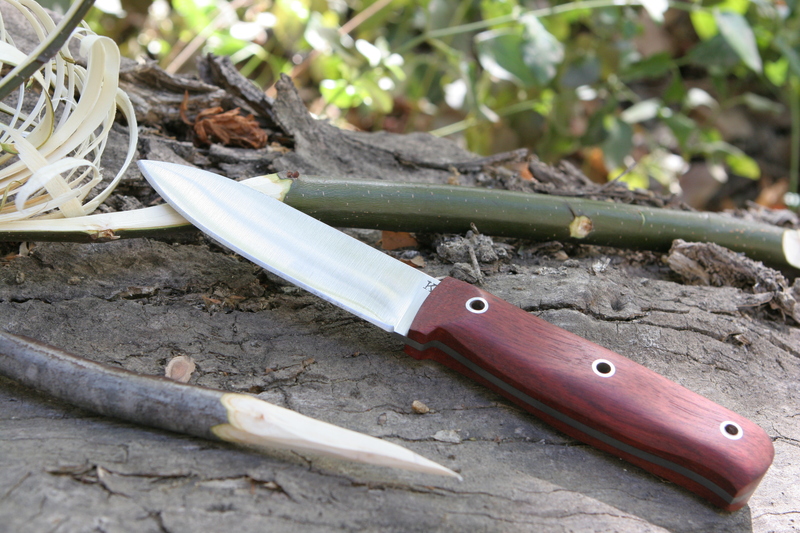 Sharp carbon steel and a comfortable handle are required for a good bush knife. Blade length varies between 3½ to 4½ inches. The blade should have a point sharp enough to penetrate deep into wood for drilling with minimum effort. Spear points and drop points are both quite popular for this type of design. Thickness of the blade is usually in the area of 3/32 to 5/32 inch. The spine of a carbon steel blade (as opposed to a stainless steel blade) can be used as a striker for a firesteel. Flat spines are better for batoning wood, since they won’t tear up your baton like a knife with a false edge would. They also give better energy transfer while being pounded on by a baton when splitting wood. 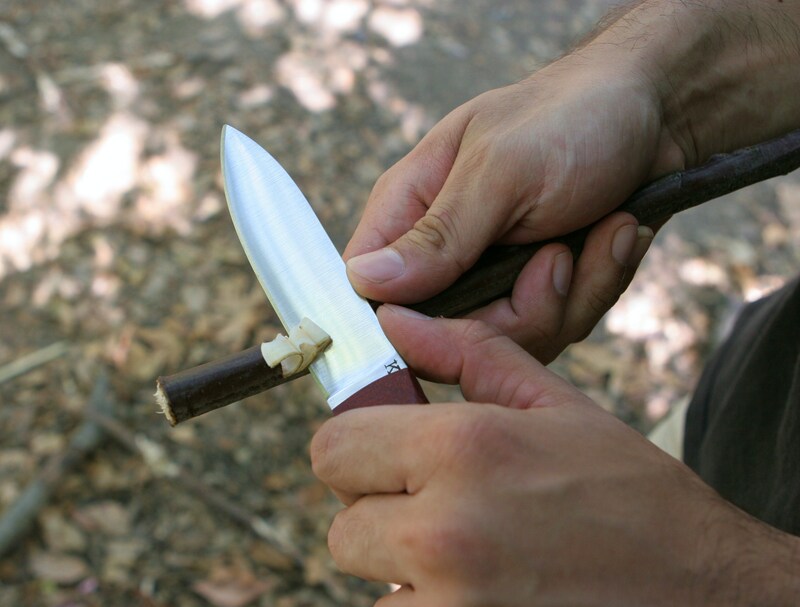 Handles should be fairly simple and free of any predetermined finger notches to optimize the freedom of movement needed for the many different grips and positions required in basic bushcrafting. Natural materials like wood and stag are favored over synthetics like Micarta, Carbon Fiber, or G-10. Unless you are doing a lot of heavy-duty stabbing, a small guard is sufficient for a good bush knife. The grinds on bush knives vary from Scandinavian, with one large single bevel, to a convex edge. While most American-made bushcraft knives feature a flat grind with a convex or V-grind, as long as the edge is sharp and easily maintained, you will be off to a good start. Push cuts used to make notch on piece of wild cherry. Both thumbs are on the spine for optimum control. By far the most common way of holding a knife is the forehand grip. Hold the knife in a firm fist-type grip with the edge facing away from you. You can cut heavy vines and tree roots using this grip, as well as make a point on the end of a stick. And whittling wood with this grip is very efficient. Be sure to keep the arm flexed and use a slow, smooth motion while applying constant pressure. This will help keep fuzz sticks nice and even. Avoid placing the thumb on the spine while whittling, as this will put uneven pressure on the object and give you less than desirable results. This is definitely a situation where practice makes perfect! Author demonstrates chest lever grip. This is where the thumb notch on the scales really shines. While executing this type of grip, the edge faces the knuckles of the hand and the thumb rests on the flat of the blade for support. Bend the elbow and position the hand (with the knife) across the chest with the spine facing the chest, edge facing out. Bring the project hand up to meet the cutting edge. The cut is accomplished by using your shoulders and back muscles with a chest out motion, pulling your bent arms away from each other. This makes for a powerful cut. The advantage of this kind of grip is that you can have it at chest level right under your eyes for very controlled cuts. Most of all, it is a safe grip because the knife is not flailing around when you follow through. Splitting wood with a baton. Stout four-inch blade proved to be sufficient. Using a baton in conjunction with a knife is a very effective way of getting heavy work done with a small tool. 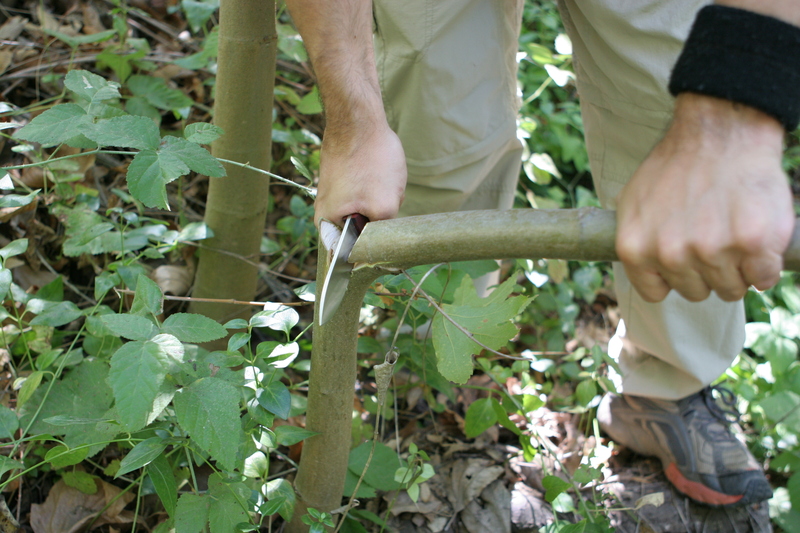 Limbing small trees and splitting wrist-thick pieces of wood can easily be done with the help of a stout baton. This is why the spine on a good bush knife should be flat and not sharpened. For splitting wood, simply place the knife blade down on the wood using one hand and, using the baton, proceed to hammer the top of the knife blade into the wood with the other hand. Once the knife sinks in deep, continue hammering the tip of the blade until the wood is cleanly split. Be aware of any rocks or gravel directly under and in the path of the knife that could damage the cutting edge while following through. When batoning in a cross-grain fashion, make sure to baton the spine directly over the wood to ensure the best possible energy transfer and lessen the stress on the knife as well as the shock on the hand supporting the knife handle. It is a good idea to baton at angles that will create a V- shaped notch, as this will weaken the wood enough to break it easily, will save energy and spare your knife from unnecessary hard use. 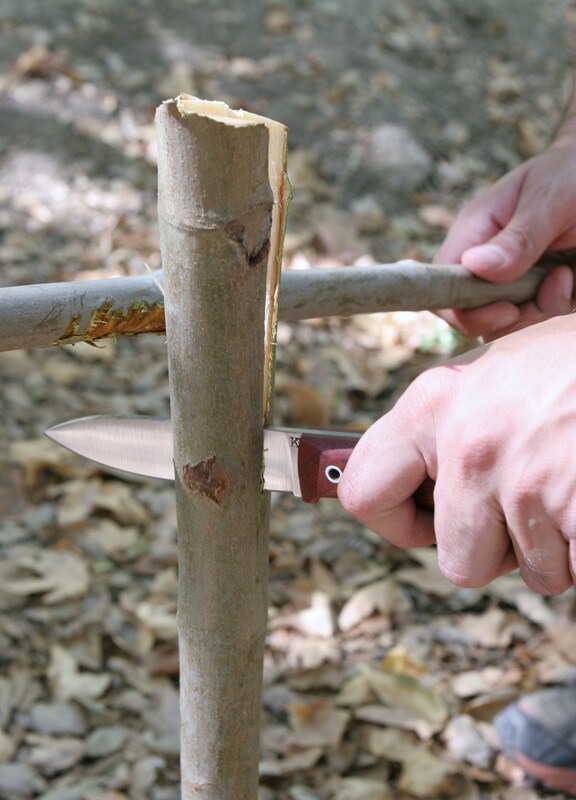 Cutting a small tree down with a knife is an easy task when done correctly. The hand holding the tree should not be positioned too far out. Holding the tree about 12 inches from the initial cut gives more control of the falling sapling. Applying tension, bend the tree and hold on to it firmly. Start the cut at a 45 degree angle at the point of the greatest bend. There is no sawing action required, just a rocking back and forth motion of the blade cutting the fibers under tension. The most important part of this is the end of the cut, when the tree is ready to snap. Restrain the tree from falling prematurely, which will require more work than is necessary to finish the cut. Done correctly, this should take no more than a few seconds. As with many things in life, the more you practice something, the better you will become at it. I can’t think of anything where practice is more important than survival and self-defense skills. 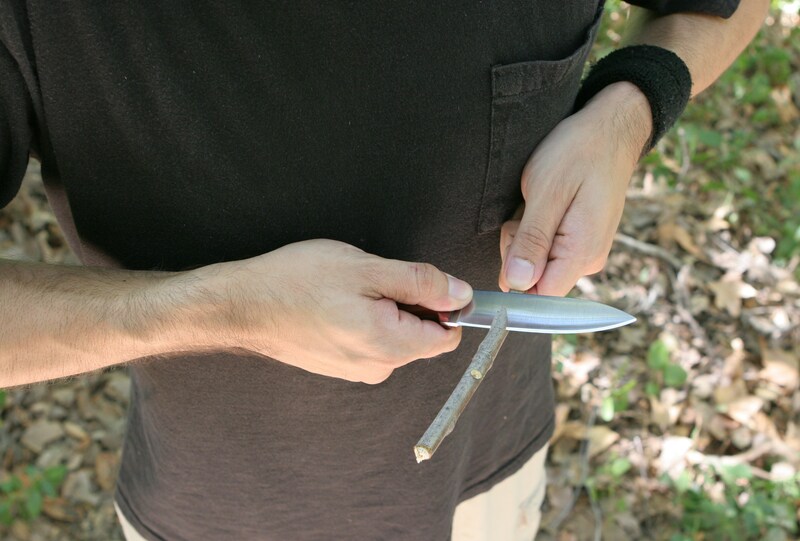 Get out in the woods—or even your backyard—and perfect your skills with a knife before you need to use it in a survival situation.